A few days ago I started a poll on the Mitalipov lab’s human cloning paper in Cell and how people felt about the mistakes in the paper. Are these mistakes a big deal or more just minor glitches? Or somewhere in the middle? Based on the poll so far with 87 respondents, readers of this blog (which includes thought leaders in the stem cell field) still are not at this time particularly confident in the paper. The results are at left. The vast majority (87%) of respondents either still hadn’t made up their minds about the paper or had some level of doubts about it ranging from minor to major. 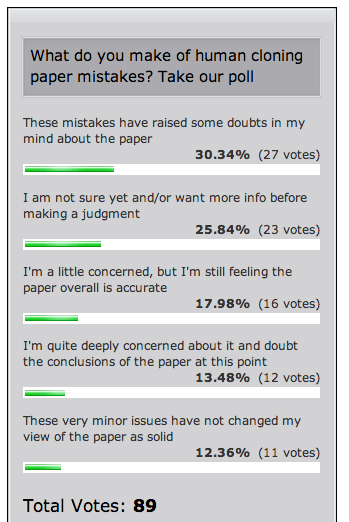 The least popular answer was the one expressing the most confidence in the paper. Devil is in the details – A paper of this magnatude deserved better. If you get sloppy on one end, it raises reasonable doubt on the other. Science and history are not mutually exclusive.